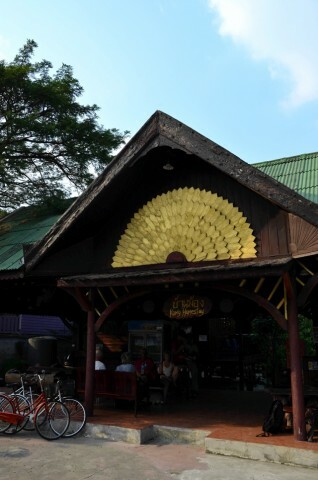 Opened in 2014 within sight of Wat Ratchaburana, Baan Kong Homestay is one of several small flashpacker-range places to sprout up near the Historical Park in recent years. Ad Book now! Rates from US$32.04++. Average rating 8.8 from 72 reviews. Fronted by an open-air roofed common space and reception area, eight large wooden bungalows were built side-by-side next to puffy flower bushes. Sporting a classic Thai design, the rooms stand on stilts and were constructed entirely out of dark-brown timber apart from the metal roofs and some tiles in the simple hot-water wet bathrooms. Fronted by spacious porches with built-in benches and moveable tables, the rooms are done up with a bunch of windows draped in soft white curtains, high ceilings, firm beds, TVs, fridges and free WiFi. A couple of the rooms occupy a single attached bungalow that families and groups can rent altogether. With Wat Mahathat a half-kilometre away and several good restaurants found on nearby Naresuan and Chikhun roads, the location is tough to beat. The cheerful staffer who showed us around had a service-minded attitude to make up for her limited English skills, but keep in mind that this is truly a guesthouse and not a traditional homestay. All rooms often fill up, with most of the business coming through Booking.com. We’d first check The Park Ayutthaya if Baan Kong is full. Otherwise you could pay an extra 300 to 500 baht for a smaller concrete bungalow with a similarly inviting porch overlooking a lotus pond at Baan Luang Harn, located a quick walk further down Chakrapad Road. In between is the similarly priced Niwas Ayutthaya Hotel, a wannabe boutique place that rose from the ashes of the defunct backpacker haunt, Baan Suan Guesthouse. Another decent bungalow option is the Old Palace Resort, offering older but cheaper bungalows near Wat Na Phra Men to the north of the island. Check rates at Baan Kong Homestay on Booking.com.